Gardening with grasses seems to me a most sensible type of garden style - so much so that I can never understand why anyone wouldn't have thought of it. Of course people should garden with grasses. So this book really appealed when I first saw it. 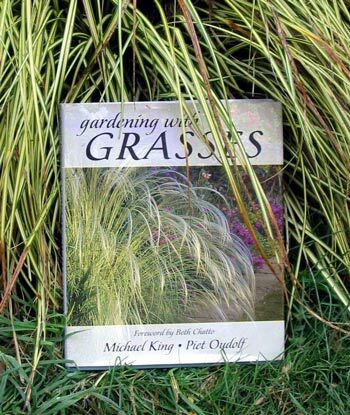 I love to see pictures of grasses used in garden borders, and this book has become one of my favourites. The famous name of Piet Oudolf guarantees a good quality read - he has become one of the new famous garden designers. Wind gardeners always appreciate the movement of grasses, and texture gardeners like the varieties of leaf form and the seed-heads. 'Gardening with Grasses' covers a great range of grass plants, and will give you confidence to use these plants in your garden designs. The authors have included a catalogue of over 150 varieties and cultivars to get you drooling. And to complete this book's impeccable credentials the foreword is written by the famous English plantswoman Beth Chatto.